My name is Ko Baas. I live in the northern part of the Netherlands. On this site I tell you something about my hobby, which is carving netsuke. Several years ago I bought an old small carving on a flea market without knowing what it was. At home I discovered it was a netsuke. I liked it so much I wanted more of them. Soon I realized that I couldn't afford good antique netsuke. Also I learned that there are a lot of cheap Chinese copies for sale. But I didn't like those. So one day I began carving them myself. 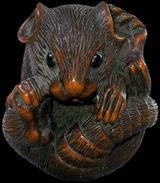 I carve netsuke since 1997. I work at my desk in the living room almost every evening. Sometimes I use pictures of old netsuke from books as examples. Or I make a netsuke of my own design in the Japanese style. At first I just used a whittling knife but I soon realized that I needed more tools. So I bought some small gouges and V-tools and adapted them for carving small objects. I also made my own tools from dental instruments. I try to make the netsuke in the old tradition so that they could be used as functional objects. The netsuke I make have to be a pleasure to handle. I mainly use boxwood. Also I like to work with different materials like stag antler, mammoth ivory, horn and teeth. Since beginning 2013 I don't take commissions any more. I was only carving for others and wasn't happy with that. I only want to carve for my self in the future. So no deadlines and only subjects I like. Added a cab claw netsuke.